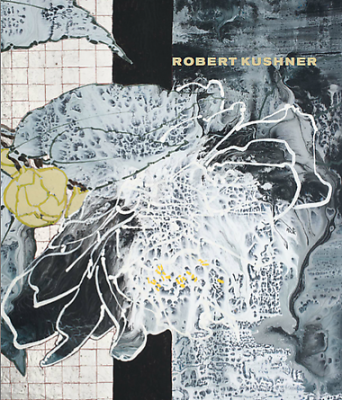 DC MOORE GALLERY is pleased to present Robert Kushner’s New Paintings / New Collages. In these new works, Kushner uses a relatively restrained grisaille color palette to explore the interplay between the natural world, specifically seasonal flora, and abstracted geometric backgrounds. Kushner’s content is consistent with his longtime interest in the conceptual and political implications of the decorative, while his newly muted color scheme lends his favored iconography a sense of gravitas. In his heroically large-scale paintings, Kushner combines organic representational elements with flat, geometric grounds of solid or textured color. In doing so, he acknowledges a unique range of influences, including Islamic and European decorative arts, Chinese and Japanese sumi-e ink painting, and American abstract painting. Kushner’s multimedia works on paper are composed atop antique texts from a variety of sources with hand-painted flowers, gold leaf additions, and found vintage photographs. In both his paintings and painted collages, Kushner unites art historical tradition with modernism and aesthetic pleasure with intellectual rigor. Robert Kushner has exhibited extensively in the United States, Europe, and Japan. Solo exhibitions have taken place at the Whitney Museum of American Art, Brooklyn Museum, and Philadelphia Institute of Contemporary Art. His work is featured in public collections such as The Museum of Modern Art, NY; The Metropolitan Museum of Art, NY; Whitney Museum of American Art, NY; National Gallery of Art, Washington, DC; Philadelphia Museum of Art, PA; San Francisco Museum of Modern Art, CA; Tate Modern, London, UK; and Galleria degli Uffizi, Florence, Italy. Publications on Kushner’s work have included the monograph Gardens of Earthly Delight (Hudson Hills Press, 1997) and Wild Gardens (Pomegranate, 2006). DC MOORE GALLERY specializes in contemporary and twentieth-century art. The gallery is open Tuesday through Saturday from 10 am to 6 pm. Press previews can be arranged prior to the exhibition. For more information, for photographs, or to arrange a viewing, please contact Meg Bowers at mbowers@dcmooregallery.com.